The cute little fairy Tinker Bell, returns in another exciting and wondrous adventure in Tinker Bell and the Lost Treasure which once again reunites viewers to the magical world of Pixie Hollow, the place where our little adventuress lives. Although this is direct to Blu-ray and DVD release, Disney have really gone to new heights in not only the quality of this production but also the story which will allow viewers, both young and old to really get drawn into this magical movie. Although Tinker Bell was not the main character in Peter Pan, Disney have really fleshed out this character and she has proven to be quite popular with younger viewers and one cannot help but smile at her amusing exploits. In this film, we also learn that Tinker Bell is actually a budding inventor and she is summoned by Queen Clarion to create a magical sceptre that will use the rays of the moon to make magical pixie dust. Unfortunately things go awry for our little fairy when her friend Terrence decides to "help" Tinker Bell, it's a disaster waiting to happen and when the moon stone powering this new sceptre is smashed, she goes on a quest to find and repair the unthinkable in this exciting animated production. Although this movie targets the younger viewer, older viewers will also enjoy the story and detailed colourful animation that features action, drama, humour and of course some good old fashioned family fun. As it's rated G, the entire family can sit down and watch this movie, time and time again, just like all Disney classics. 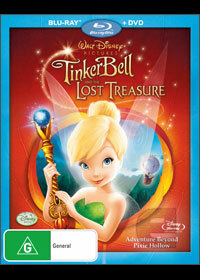 Apart from the loveable characters in this current film about Tinker Bell, what makes them so loveable is the professional voice acting that includes Mae Whitman as Tinker Bell, Kristin Chenoweth as Rosetta, Jane Horrocks as Fairy Mary, Anjelica Huston as Queen Clarion, Jesse McCartney as Terence and of course Lucy Liu as Silvermist. They really get right inside their character's heads and flesh them out from those clichéd and sometimes over the top animated characters. Needless to say, together and with the well-written story, they create something that children will be thoroughly drawn into and can watch time and time again. With some great animation that looks superb on Blu-ray, matched with high quality sound, this release also boasts a plethora of special features from humorous "bloopers" to deleted scenes and a catchy music video with Demi Lovato. At the end of the day, this is a great animated film from start to finish. Fairy bloopers: Fairies make mistakes too! Magical guide to Pixie Hollow: Explore the Magical Guide, this time in the autumn area of Pixie Hollow. Pixie preview: Exclusive animated vignette featuring Tink and her friends. Deleted scenes: With Filmmaker’s intros. Pixie Hollow comes to Florida: Discover how the filmmakers help transform Epcot Center into Pixie Hollow. Music and more: The Gift of a Friend music video with Demi Lovato.